This is the N Scale Glacier Gravel Co. - Kit - 5-5/8 x 6-5/8 x 6-1/8'' from Walthers. The smooth operation of your railroad all rests on ballast. Without ballast your railroad is mud! Railroads have an enormous appetite for crushed rock. A mile of mainline can gobble up thousands of tons. Glacier Gravel Co. will help satisfy your railroads appetite for rock. Glaciers hefty rock crusher is typical of those found at quarries across the continent. Here, hard rock is crushed into 3" to 6" chunks and loaded into ballast hoppers for a trip to the dumping site. These hoppers are equipped with special longitudinal doors that allow the ballast to be dumped on both sides of the rail. Glacier Gravel Co. features corrugated construction on a heavy poured concrete foundation/loading tunnel. Conveyors to a truck dump and feeder from the quarry complete the facility. 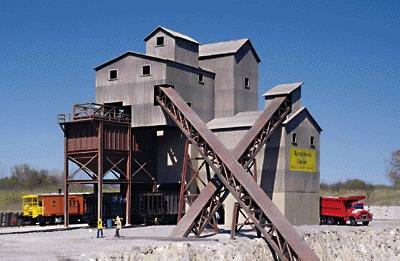 Rock crushers similar to this have been in use since the 1940s, so Glacier Gravel Co. will fit perfectly into transition and modern era layouts.